Not sure how to use cancer fighting spices in your everyday cooking? 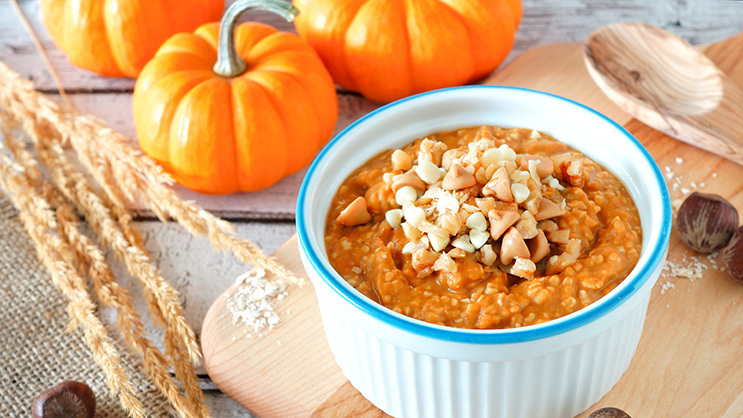 Try this Overnight Oats with turmeric and ginger in honor of Pancreatic Cancer Awareness Month! This recipe uses the anti-inflammatory, cancer-fighting spices, turmeric and ginger. The pumpkin kicks it up a notch, making it feel rich and indulgent—perfect for a fall morning! Overnight oats is a great alternative to traditional oatmeal. Pumpkin is full of vitamin A, vitamin C, and potassium. You can use canned, unsweetened pumpkin in this recipe. Oats provide fiber, magnesium, protein, and potassium. By simply soaking the oats in liquid you are essentially “cooking” the oats, making them more digestible and avoiding the need for the microwave altogether. Bonus—this recipe takes all of 5 minutes to put together. The end result is a super creamy, hearty and delicious breakfast! When you make this recipe, you will truly feel like you’re “kicking cancer in the kitchen!”. Recipe adapted from Siggis Dairy. Store in the refrigerator until the oats absorb all the liquid (at least four hours, ideally overnight). Can be served cold or warm. *Top with almond butter, crushed nuts, shredded coconut, or ground flaxseed for extra calories and protein. Calories: 210, Protein: 13g, Total Fat: 4g, Total Carbohydrates: 30g, Sugars: 10g, Fiber: 5g. Currently fighting pancreatic cancer? Join the Columbia University Medical Center Pancreatic Cancer Support group. Family and caregivers are welcome!